Nature is awesome in so many ways and we love to capture its unique beauty in our photos. Natural backdrops are all around us and make our job much easier when we want to create a beautiful scene with a bride and groom. Grey County is especially popular when it comes to landscapes and breathtaking scenery. 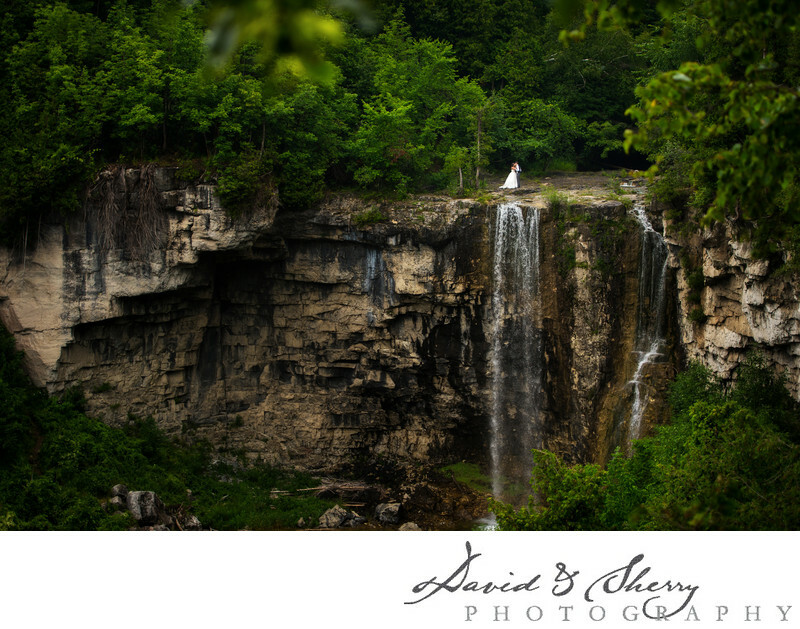 With rolling hills, lakes, forests, and rivers, this area has endless possibility to get amazing wedding photos. The Grey County area is also quite well known for its many waterfalls, such as Eugenia Falls Conservation area, which is located near Beaver Valley in Ontario. This hidden gem is accessed by a winding trail that goes along an escarpment, giving a clear view of the 30m high falls. Depending on the time of year, the water either rushes quickly off the edge, or lightly trickles down the rock. We were lucky to arrive at this shooting location in the summer when the area was safe to be around and the river was lightly flowing. This adventurous couple was excited and enthusiastic about standing at the top of the waterfall as I shot from the edge of the cliff on the opposite side. I love the couplescape we were able to create with this scenery, and how it highlights the incredibleness of nature while featuring a bride and groom. Location: County Road 13, Eugenia, ON N0C 1E0.